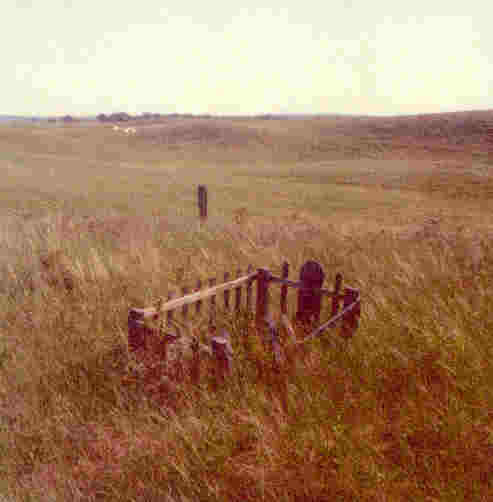 Long Cemetery is located 6 miles north of Seneca, Ne. Section 22, Range 30, Township 25. It is doubtful that Jimtown is listed on any map. Many memories are associated with the place but all that is left of the one-time community site is a cemetery. If Jimtown had city boundaries, it would have been a sizable place. It can be found 5 1/2 miles north of Seneca, on a dim trail that leads over the hill. Jimtown school was once in sight of the main road-70 years ago. Past the school the trail led to the church and about 3/4 of a mile beyond was a sod community building. Memories of the town are kept alive by Leo Edelman who said the church was an Episcopal Church which was used until the advent of the automobile.All that remains at Jimtown is the cemetery. The 50 by 75 foot plot is the buriel site for 6 young children and one man whose age is not known. Although no one has been buried there since 1917, the Jimtown Cemetery rivals any city memorial park for beauty. It has been preserved through the efforts of Edelman, a retired railroader who lives in Seneca. Four years ago, Alvo Crawford a neighbor, became concerned about the disrepair of the cemetery. Cattle were getting in and ruining the graves. After the fence was rebuilt, Leo Edelman the retired railroader started mowing the cemetery in May, July, and September. From a distance the mowed area rivals a bluegrass lawn for beauty and is more durable. The site holds many memories for him. When he was only 4 years old, his twin counsins died in 1917 after their birth. He said the neighbor ladies loveingly lined a wicker box measuring about 18 inches lond with cloth and used it for a coffin. Edelman, at his own expense, made white concrete markers for the unmarked graves. Through monument companies he purchased bronze placques and set them in the concrete. Each year he places artificial floral arrangements on the graves. Jimtown--- never really a town, but a center that provided for the education and religious needs of the early homesteaders, and was part of an era when lthe land was more densely populated than it is today with its large ranches. How it got it's name will always be an unanswered question. Everyone agrees that the name just came out of the blue sky. The same blue sky that provides a canopy for this small hallowed spot in the Sandhills. This story was originally published September 24, 1981 and written by Ruth Donohoe, correspondent. The story is reprinted here, courtesy of the North Platte Telegraph Newspaper. The information and pictures were given by Ruth Harms who walked the cemetery in June 1974.